"What do you want for dinner?" Seriously, every time Mike asks that, my answer could be this scampi. 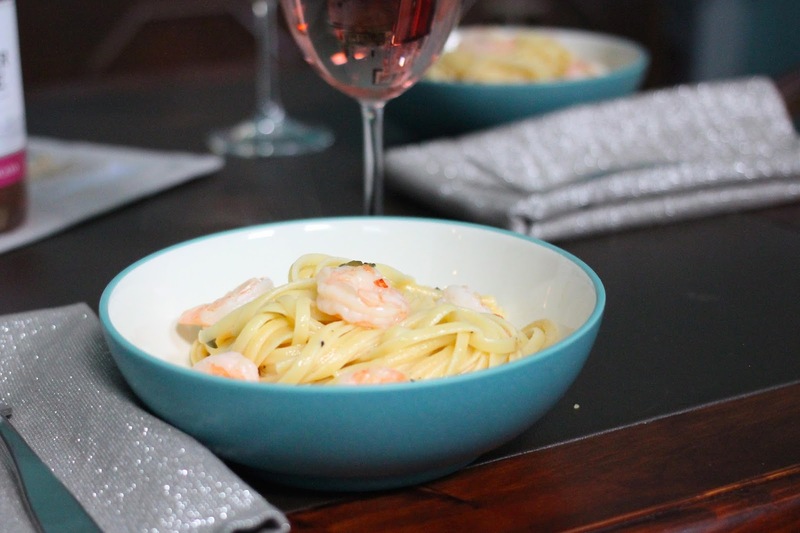 My bff Amanda introduced me to this awesome way of making scampi (with triple sec), and it's so much more delicious and the traditional recipe that uses only white wine. I love to tangy citrus addition, and it's such a fresh summer meal. 1. Chop garlic, oregano, and basil. 2. Boil pasta in salted water as directed on package. 3. Heat butter and olive oil on medium heat. 4. Once butter melts, add garlic and sauté until fragrant (1-2 minutes). 5. 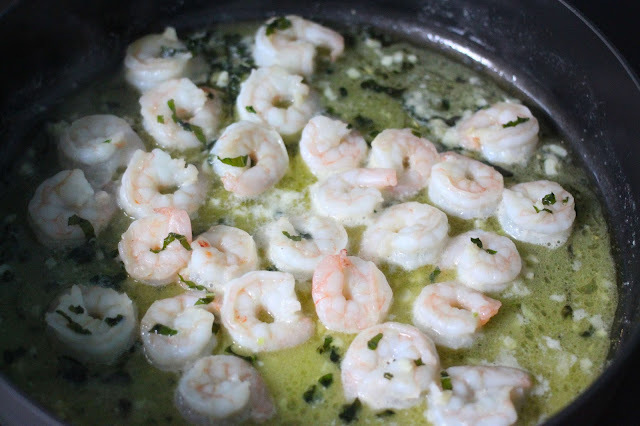 Add oregano, basil, and shrimp and spread into one layer in the pan. 6. Cook for 4-5 minutes, until edges are pink. Flip all shrimp over. 7. Add lemon juice, triple sec, wine, and salt/pepper to taste. Cook 2-3 additional minutes until completely pink. 8. Add cooked pasta to shrimp/sauce pan and top with freshly grated parmesan. Now if you don't have triple sec on hand, I learned a couple of years ago on our honeymoon that triple sec is the same as blue curacao. We bought of it when we were on a tropical drink kick when we got back from The Bahamas, and it's been sitting on our drink cart since. 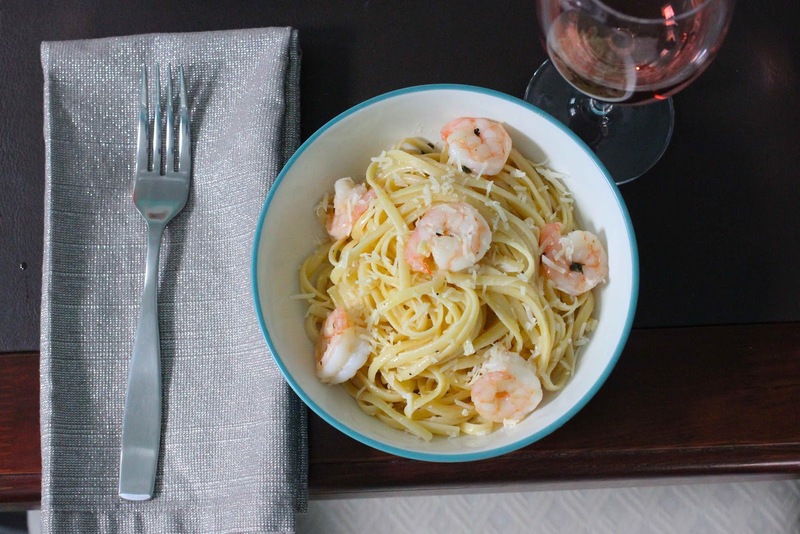 When we wanted to make scampers (as we affectionately call our favorite meal) and didn't have any in the house, we used the curacao. Yup, it made everything blue - no crazy editing here. Looks bizarre, I know, but it was just as delicious. What dinner could you eat every day? It looks delicious - even if it is blue! 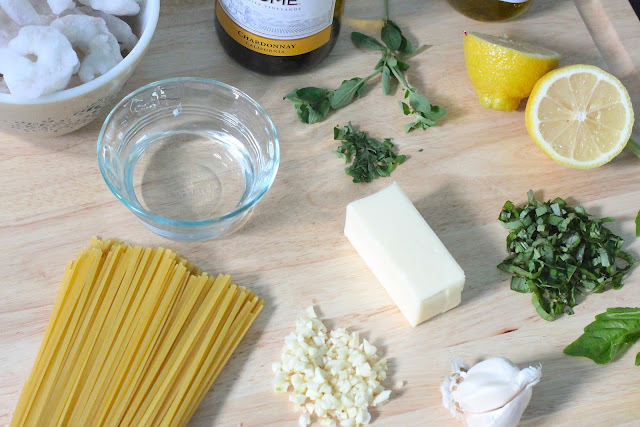 This is the perfect summer meal. Anything with lemon is a winner in my book. I had no idea that Blue Curacao and Triple Sec were the same! You totally should have made that for the 4th of July for a festive dinner! This looks SO good! I want shrimp now! 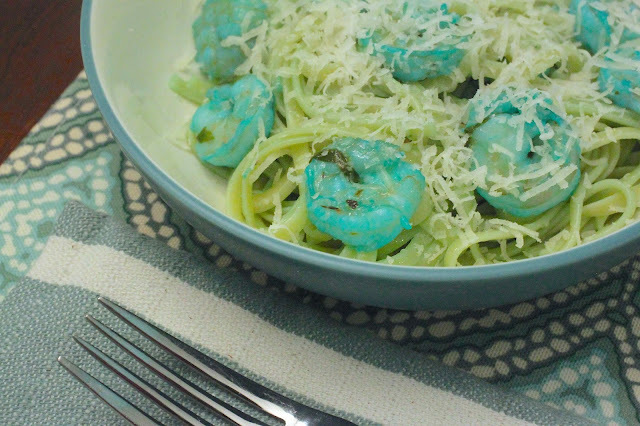 Those blue shrimpers are messing with my brain, but the scampers looks delish! That looks D I V I N E, Meg!! !